The first spot, “Memories,” opens on a snowy day in January, showing two brothers in a snowball fight with the neighborhood kids in front of a Lexus ES sedan. The camera cuts to the younger brother searching for Easter eggs in the park in April — and gleefully finding a colorful yellow egg under the big red bow on top of the Lexus. Fast-forwarding to a bittersweet moment in August, the family unloads the ES to move their older son into his new college dorm. For the 19th consecutive year, Lexus is launching its annual “December to Remember” Sales Event. 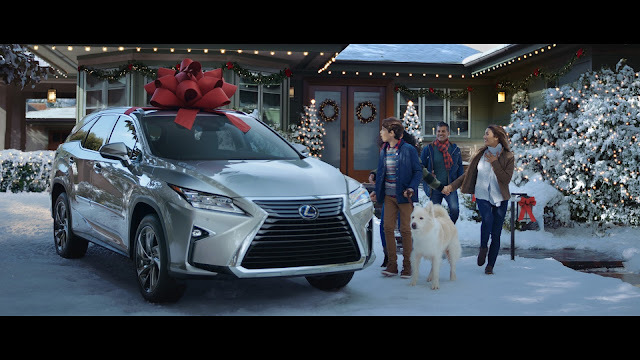 The iconic marketing campaign debuts today with three national spots, showcasing how the gift of a Lexus during the holidays offers amazing experiences throughout the entire year. “Celebrations” depicts a family of four running for cover to their Lexus RXL SUV after getting caught in a rainstorm during the daughter’s May quinceañera. In the next scene, the family is enjoying fireworks and sparklers atop a scenic overlook on the Fourth of July. We cut to a high school football field in September, seeing the son suited up for the big game as he runs past the RXL. “Joy,” the final spot, starts in February with a couple leaving a romantic date in their Lexus NX crossover on Valentine’s Day. The woman appears behind the wheel of the NX in the next scene, where the couple is leaving the beach in June. The camera cuts to the NX parked on the street of a neighborhood on Halloween with children in costumes trick-or-treating. A little girl in a ladybug costume gazes at the NX topped with the big red bow, matching the one she wears in her hair. To extend the reach of the campaign, adaptions and translations of “Joy” were created for Asian-American audiences across five key markets, while “Memories” and “Celebrations” have been adapted for Black and Hispanic audiences, respectively. The broadcast spots begin airing nationally today on prime time, late night, cable, sports programming and more. The print campaign features bright product-focused imagery, noting, “‘Tis the season for great offers on the gift you can unwrap again. And again. And again.” Digital will run on popular automotive, lifestyle and sport websites and out-of-home extensions will appear in 11 key markets, including high profile placements in Times Square and Capitol One Arena. The December Sales Event offers incentives through Jan. 2, 2019. To view additional spots, visit youtube.com/lexus.